There was a lot of talk a few years ago about standing desks and how they were so much better for you, and that “sitting was the new smoking.” But, I always thought “no way, that’s not for me.” I like to sit, with my chai (at home or a cafe) when I write (and I just couldn’t picture it feeling comfy). So when I heard an author talk about writing at his walking desk for most of the day (in an interview on The Creative Penn) I was kind of fascinated (in a “I’m totally never doing that” kind of way). But at the end of last year, as the cookbooks were finally drawing to an end and I began contemplating my goals for 2018 (of which “get healthy again” was in the top 3), I began seriously considering a standing desk, mostly because I was having some hip problems that made sitting and walking uncomfortable. 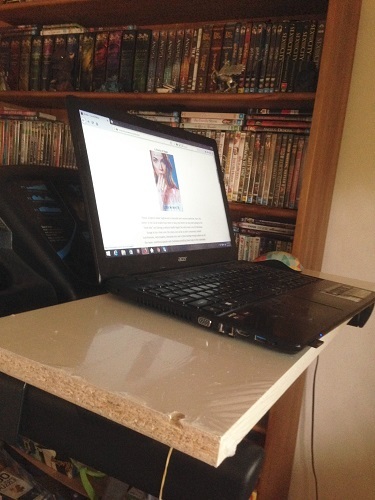 (To be clear, I still had no intention of a walking desk…I mean, how does that even work??). Anyway, fast forward a couple of months and my hubby and I were discussing the desk situation again. He suggested placing a board on the handles of our treadmill to see if I could get used to the concept of a standing desk (also, because we don’t have a lot of space in our house – last year I found a sweet, inexpensive little desk which I loved sitting at – until my hips hurt and forced me to the cafe almost each day – I am serious, it was the only place I could work sitting all day without pain). I still wasn’t sold on the standing desk idea and we left it at that. But last week when the kids went back to school and I decided it was time to get serious about getting healthier. I looked at the treadmill again and said, “ok, let’s give it a go.” We found a spare shelf from the cupboard I use for my herbal dispensary and guess what? It fit perfectly across the treadmill. Guess what else? It’s a good height too! 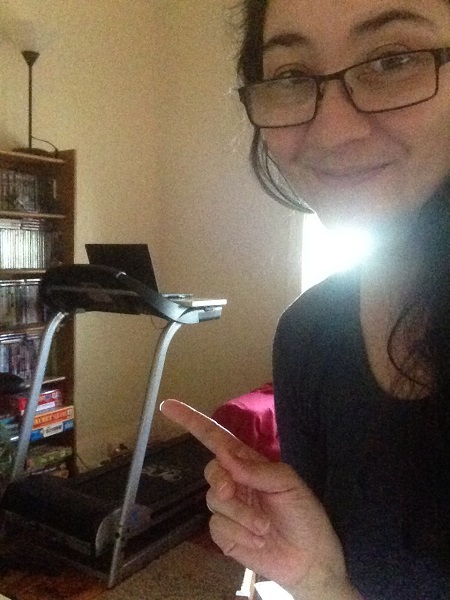 As I was standing and my hips started to feel a little achy, I decided (just to prove it was a crazy idea) to put the treadmill on slowly…. (and I mean really slowly – e.g. 1-2 km/ hour) and guess what? I LOVED it! I started walking and listening to music and writing and I didn’t realise I’d been walking for an hour! So my hubby (B) and I are going to make some adjustments to the shelf so that it’s more stable etc, but this is pretty much my new writing set up 🙂 I don’t always walk while I write (like now, while I am writing this), but I’m making an effort to stand and walk each day, so that when I come to reading in the evening (or watching TV) I can do so without pain.